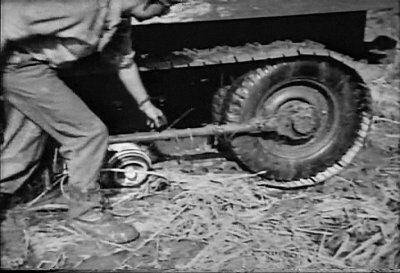 During the war it seems as if just about everything was tried or tested. 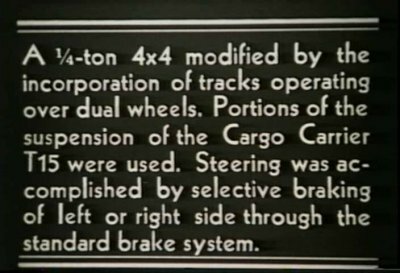 This includes a jeep with complete tracks. 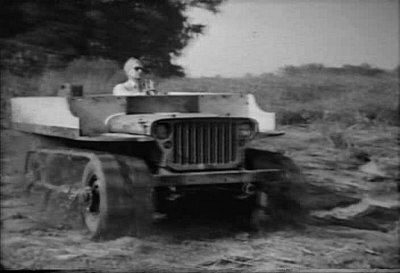 These pictures are from a silent film as viewed on the Nothing But Jeeps DVD available from Vintage Video. This seems like it would be relatively easy to recreate. The majority of the body appears to have been cutaway and replaced with wood. A good candidate would be an old jeep with a body beyond repair. 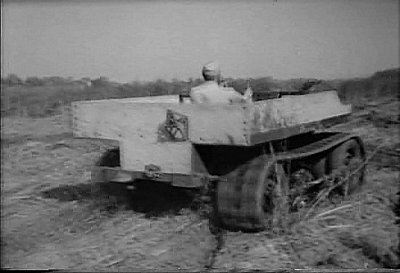 Close up of the original track system, reportedly taken from the project vehicle (T-15) that was to eventually become the Weasel. While it may not look like it in these particular photos, the area of operation is very muddy. Standard jeeps could not make it thru. 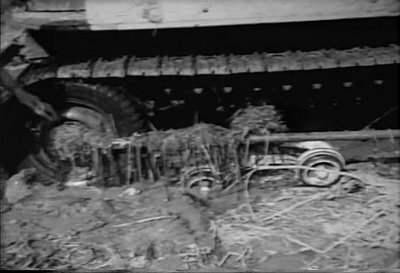 Most of the experimental jeeps also bogged down. Not really sure what the outrigger spar between the two sets of wheels is for. It looks like you could skip this piece. The bands could be made from rubber matting and the cross pieces might be able to be made from tubing pressed into shape or individually welded. It should be that hard to fabricate a method to bold two wheels togehter…perhaps a short piece of pipe with a flange with a bolt pattern that matches the wheel. Vehicle control can simpley be two master cylinders with the brake system split into a left and right control. Well, it’s on my to do list…maybe one day, I will get around to it.